New meters to show your health and hunger more accurately (with hover text). New inventory bar art tweaks. In addition to normal rain storms, there are also now sometimes Thunder Storms that create lightning strikes. You'll see them appear around you as electric glows on the ground before they (might) strike. Be sure to stand clear or get indoors! It's disabled on the Mac version for the time being until I can figure out where my implementation is causing hangs/freezes. 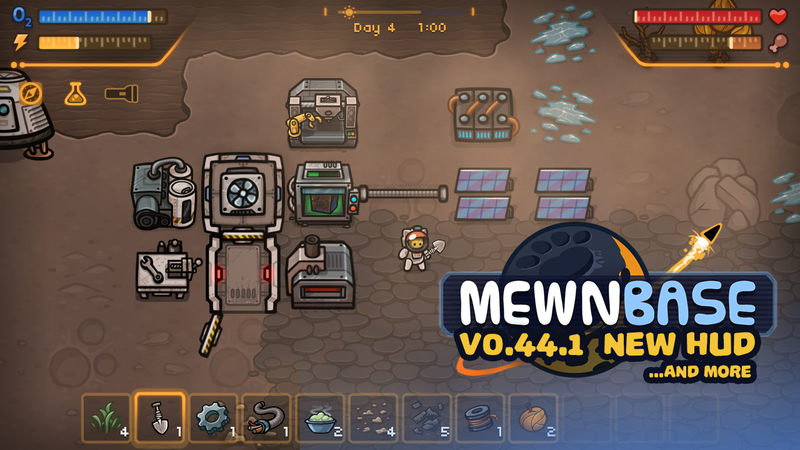 Known issue: For Windows and Linux, it doesn't seem to register and show you're playing if you launch MewnBase from within the Itch desktop app. Better saved game folder naming (now based on your character name, instead of a terribly long random number/string). Science Lab now drops research items that are currently being processed when you pickup the lab. Tab key now both opens and closes the Tech Tree popup. Added a "What's New" popup that displays each time the game is updated, also viewable by clicking the version number on the main menu. Item class refactor - it's been tested for a bit, but if you end up not being able to load your older saved games (hangs, freezes), please send me the crashlog or your save folder! libGDX updated to a newer version.